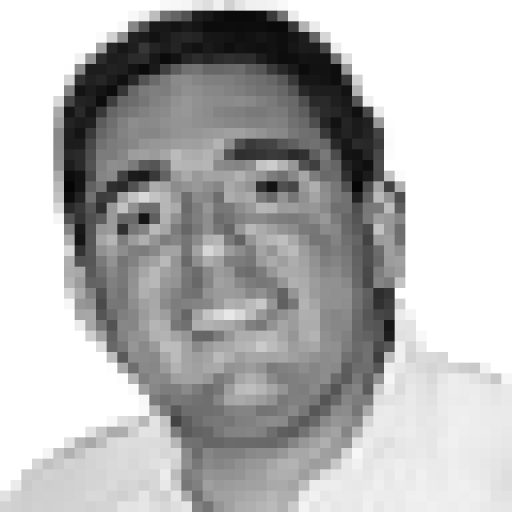 Tony Tannous, "The Round Ball Analyst", is a Sydney-based freelance football writer of all things technical and tactical, and has been covering Australian and international football for over 20 years. 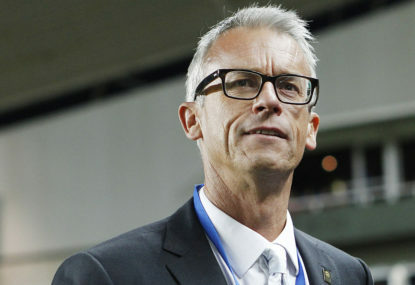 Tony is a pioneer of football analysis downunder, having started Australia's first football blog, "The Round Ball Analyst", in 2006, and has been an integral part of The Roar since 2009. 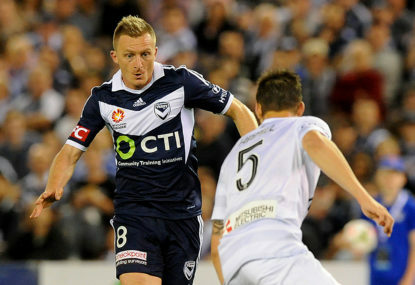 On the field it’s been an outstanding A-League season, perhaps the best yet, as I wrote two months ago. Australians have every reason to be delighted with the progress of Ange Postecoglou’s Socceroos as they navigated their first phase of qualifiers with a style reminiscent of some of the play we saw under Guus Hiddink. 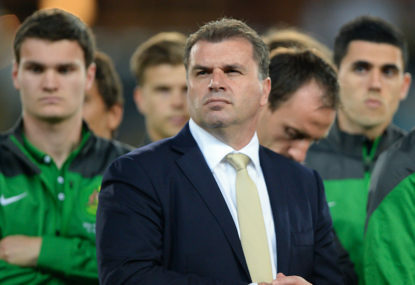 With little hype and fanfare ahead of tonight’s World Cup qualifier in Adelaide, it makes it hard for Ange Postecoglou to get his players up and in the right frame of mind to get the job done. If the success or quality of any competition is to be measured by its evenness and depth, and there is some debate if that’s entirely the best method, then the A-League has made strides in the right direction this season. Much of what went on in the terraces at Etihad Stadium was about flexing some muscle to send a message about who is the biggest club in the land. Those Wanderers fans who took it too far have since received an unequivocal message to pull their heads in. To say it’s one of the most anticipated games of the season would be underselling tomorrow night’s clash at Wanderland between the top two, the Western Sydney Wanderers and Melbourne City. When the Western Sydney Wanderers arrived on the A-League scene it promised to represent the region’s best values of hard work and honesty, rather than encourage one of the biggest problems in the region, gambling. It’s been a crazy old year for the round ball game in Australia. From the highs of the Asian Cup and the win by the Socceroos on home soil in January to the fan walk-outs and boycotts of the A-League earlier this month, drama hasn’t been too far from the surface. 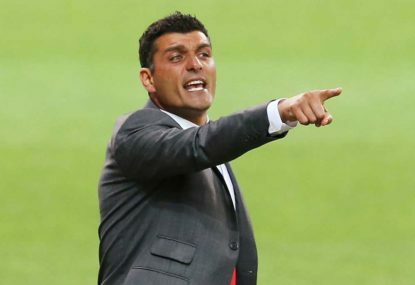 The one thing that’s struck me watching the Western Sydney Wanderers this season is just how calm and composed everyone is, and much of the credit for that appears to lie with the three-pronged Spanish anchor on the field and their little compatriot sitting next to Tony Popovic on the bench. 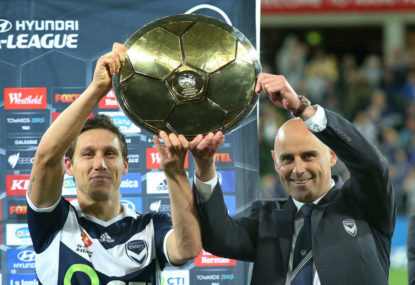 Right now, if you were looking for leadership and where the power lies in the round ball game in Australia, you’d be hard pressed to go past the Melbourne Victory and Australia’s football fans. Football’s head office might feel it’s stuck between a rock and a hard place in terms of trying to keep everyone onside, but right now they ought to go into bat for the football family. It’s been a few weeks since my most recent post on The Roar and as always there’s so much to talk about in Australian football. It wasn’t that long ago that Matt McKay was the Socceroos permanent makeshift solution at left-back and there seemed no immediate specialist in sight. Now it’s the right side of Australia’s defence where the options appear barren. It’s Sydney derby time on Saturday. If the Western Sydney Wanderers are to take anything from their trip to the SFS, their front three of Romeo Castelen, Frederico Piovaccari and Jaushua Sotirio need to find the polish and start producing the currencies that count up front: goals and assists. Not fancied by many to make any impression this season, the three local ‘newcomer’ managers to the A-League all made a flying start in the opening round. If the A in A-League stood for ‘ambition’ at the start of the 2012-13, when Alessandro Del Piero, Emile Heskey and Shinji Ono were paraded around Parramatta Stadium to hundreds of journalists and photographers at the season launch, then ahead of tonight’s Season 11 kick-off, the A now stands for ‘austerity’. Socceroos road to Russia: How far can they go under Ange? There may be a degree of the unknown in what awaits the Socceroos in the first phase of qualifying for Russia 2018 after Tuesday’s draw, but there’s also a sense of anticipation that wasn’t there at the beginning of the past two qualifying cycles. 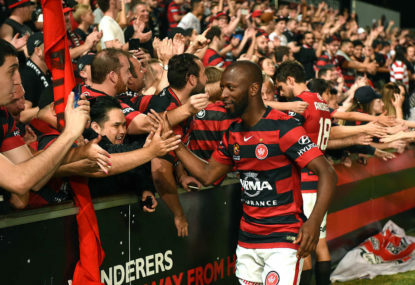 Has Popovic finally found a solution for the Wanderers? 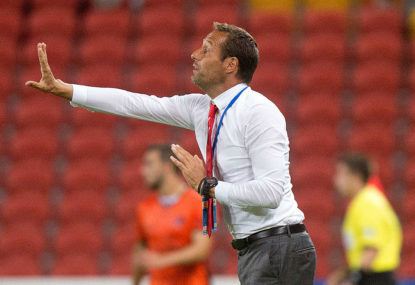 Tony Popovic has struggled this season to get the Western Sydney Wanderers playing proactively. But last night, by playing Japanese playmaker Yujiro Takahagi deeper in midfield as one of his two holding midfielders, the Wanderers arguably looked the best they have this season. 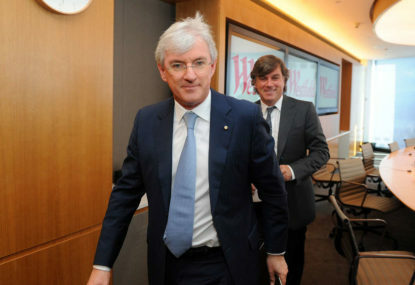 Is any publicity good publicity for the A-League this week? 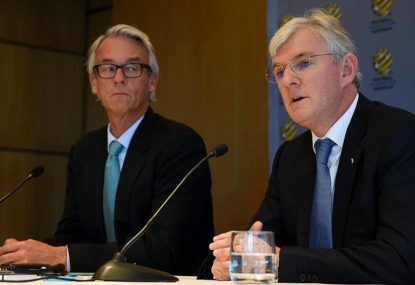 This week might have been all about players misbehaving, on and off the pitch, but given that the A-League is generally struggling to hit the heights of a couple of seasons ago, is any publicity good publicity? It wasn’t so long ago, only 2012 in fact, that football fans were pulling their hair out about the length of the A-League off-season. Good point. Casual fans can probably be excused for not quite understanding the finer details, thus pieces like this where I try to provide some technical insight in a language they can resonate with. Yep, no doubt Postecoglou swung the pendulum with an eye to the future, choosing Luongo/Sanisbury/Troisi over, say, Bresciano/McKay/Milligan/Wilkinson. Just has to drop by to say what an outstanding piece this is Dom, one of the best I’ve seen here in my five or so years on The Roar. Football, for me, is as much about the experiences it gives you to get to know & meet the world, and they’re the mems I most have of Germany in 06. Congratulations & best of luck on Tuesday, I’ll be there. Any other highlights of the game floating about? Johnno, if you read the article you will see that I have mentioned Henry and added that he effectively played as a right-sided winger in France 98, not a number 9. That was when he played. If you remember, Henry was only 20 at the time of the tourni and didn’t feature as a permanent starter. In fact, in the knockouts he came off the bench in the semi and didn’t get off the bench in the final. My recollections are that he emerged at France 98 but his best, most consistent football, followed later. I was a massive fan. In fact, he’s one of my favourite ever footballers, but the point here is that he wasn’t the main central striker in France’s World Cup success. Jacquet effectively had the avg Guivarch as his main number nine, and like Fred he copped a whole heap of criticism. But he ended up a World Cup winner at home. Can Brazil replicate Les Bleus' home success without a world class striker? Tim Cahill has now scored five World Cup goals and it just dawned on me a little earlier that the last three (one v Serbia in 2010 and the two here) have all be assisted by the right fullback at the time, Wilkshire in 2010 and Franjic and McGowan in Brasil. You’re right in that he played the second half of a warm up game against Parana Clube at left back, but he’s very left footed, so can play as cover for Davidson if required. You’re right about centre backs playing on the right. Given the circumstances I think McGowan has done ok the past game & a half but agree that long term he isn’t the obvious option there. Of course, Franjic has to find games & fitness. As to the alternatives for Spain, I know that Milligan was being mentioned as a right back option for this one before his hammy, & there’s talk he msy be back for Spain, so it’s an option. But I wouldn’t be surprised if McGowan gets another crack. As I said, thought he did ok, and I remember being impressed by him as a right back for Hearts against Liverpool in a Europa league game a couple of years ago. Thanks Sheek, it’s arguably the biggest football nation never to win one. They have a great manager & front two, huge strengths, but we exposed a few weaknesses in defence & mid today that others may go to school on. Reconstruct because his predecessor couldn’t and wouldn’t do it, and his predecessors boss saw it too late. We all called for it & now we’re bashing what we called for, think about it..
Fair enough be frustrated that we’ve left out rebuild for the world cup too late, but don’t take ir out on a manager who is doing what everyone called for and can’t be blamed cause he hasn’t had the time. You mention Rasic but from what I understand he was able to get his team together over a long period and for very long periods. They became a club, building understanding. AP doesn’t have that luxury. It’s the way of modern football. Hi Scott, my take on it is that Ange likely gave Neill the opportunity by having a close look, in and around the squad etc, and gave him an op to find regularly and quality football. The more fundamental question is do administrators and authorities even want active support? Fuss, you happy for there to be no active fans? Seems the direction we’re heading in at the moment if non-active fans are happy for it to be stamped out. To me active support is a crucial part of the A-League game-day experience, particularly as the quality on the field seeks to improve (which we haven’t seen this season).